A state Supreme Court ethics official Robert Correale misuses his government and court office to Cover-Up and block ethics violations and legal malpractice charges against his own law firm, Maynard & Truland. After eight years, the Cover-Up leads all the way up to the Governor's Office, Attorney General's Office and the state's Supreme Court and Superior Court and now, possibly the New Jersey State Legislature. On Friday afternoon (Dec 12, 2008), Congressman Jim Saxton's Mount Holly, NJ staff placed a call to my Congressman Scott Garrett's office. Ms. Tatiana Marquis (201-712-0330) stated that a letter was sent to NJ State Senator Steven Oroho and NJ Assemblywoman Alison Littell-McHose. At this time, I do not know what was in the letter. I'm extremely thankful to Congressman Saxton's Mount Holly, NJ's staff for getting in touch with Congressman Garrett's staff for an update. Congressman Saxton's staff member also highlighted the key to resolving my charges of a New Jersey State Government corruption cover-up must come from NJ Senator Oroho and NJ Assemblywoman Littell-McHose. Still not getting through to them directly, so I just sent the message below through their webpage "Contact Us" link. I hope to hear from them and if so, I obviously will get back to you immediately. I'm writing on behalf of John "Jack" Cunningham. I've tried to contact both of you directly by phone, but have failed to reach you directly, and my calls have not been returned by you or your staff. My concern, in short, is that Jack Cunningham gave honorable service to his Country and Corps and deserves to be heard regarding his allegations of corruption in his home state of New Jersey. I believe his charges have merit. I also believe that you, as his sworn, legal representatives are duty bound by both law and ethics to hear him out. By now, (eight years), I know that you have his contact information and are familiar with his case. I ask you to please not just "forward this on" to yet another layer of bureaucracy, but take the immediate action necessary to take corrective action and close this case openly and legally. Thank you in advance for your time, interest and action. Theft of an honorably discharged veteran's constitutional rights and due process under the law, by deception. John (Jack) Cunningham, my father, is a Vietnam Veteran, who is 100% disabled with Post Traumatic Stress Disorder (PTSD), based on the Federal Department of Veteran Affairs (VA) guidelines. He is a respectful, loving, and caring man who would do anything for anyone- yet he does not receive the same consideration. I am writing this letter to you now in hopes that someone will stop “forwarding” the letters that he sends and actually do something about the unfair treatment of my father. It has been an eight year, life altering, battle trying to get his Due Process from the State of New Jersey regarding the charges of corruption, Cover-Up and Conflict of Interest within the New Jersey Governor’s Office, NJ Attorney General’s Office and New Jersey Office of Attorney Ethics. He has sent countless letters dating back to 2003 to Senators, Governors, Attorney Generals, etc. - but to no avail. Those who have answered allege that they have “forwarded the letter” to the appropriate people. The State of New Jersey is more interested in avoiding defacement to its public, professional and national image then to comply with a disabled veteran’s civil right to due process. At the center of this are the New Jersey Supreme Court’s Office of Attorney Ethics and one of their Vice-Chairman, Robert Correale. Robert Correale committed a number of ethics violations as well as openly committing perjury to the NJ Supreme Court, as well as false billing and overcharging. Important court documents have even gone missing! He can do this because he thinks he is above the law in the State of New Jersey and so far no one has proven otherwise. No one should be above the law especially if they have spoiled the life of a man and those closest to him!! Many people are apprehensive about saying or doing something about this situation since it is in regards to charges brought against “important” people…if only they could see what it has done to my father, his family, and his friends. What if this was a member of your family? What if someone you love was hurt and treated so unfairly, and though someone can do something about it, no one wants to or maybe they’re just too busy? John (Jack) Cunningham has more than enough evidence and facts to support himself in this case – he just needs one person to get him in there and realize how unfair this really is. It has been 8 years. I am hoping that there is someone out there that will stand up for what is right and help give what has long been deserved – justice. There has to be at least one decent, understanding politician out there, right? Please be that one! Please make a brief phone call to my State Senator Steve Oroho and my Assemblywoman Alison Littell-McHose. One call will handle both, since they are at the same phone number (973-300-0200). Please ask, why they do not return Colonel John Bates' (retired, 30 + years Marine Corps veteran) phone calls concerning Jack Cunningham's charges of New Jersey's government corruption and cover-up. And please ask who will be investigating the missing Superior Court transcript on the charges against Robert Correale's legal malpractice. Please ask others to call. Thank you very much for your return letter (below) regarding my charges of corruption, Cover-Up and a Conflict of Interest within the New Jersey Governor’s Office, NJ Attorney General’s Office and New Jersey Office of Attorney Ethics. My family, my supporters and I greatly appreciate your interest. The reason why this has been going on for eight years is because the State of New Jersey follows these same Cover-Up procedures. My question to the State of New Jersey Legislature is what is going to be different this time around? Will my clear evidence be reviewed by an interested New Jersey Government agency, or will this be just another waste of stamps and continued exacerbation of my PTSD disability? Also with this letter, I’m requesting a meeting with the two of you. My family, my supporters and I are looking forward to your continued interest on these issues. One disabled Vietnam vet has been battling eight years to prove, "no." As per the conversation you had with my wife Joan, please find the following information pertaining to my eight year struggle to initiate an investigation of my charges of corruption, cover-up and a Conflict of Interest within the New Jersey's Office of Attorney Ethics and the NJ Attorney General's office. Eight years of battling for Due Process is much to demand from an honorably disabled PTSD veteran. Simply stated, I am requesting Governor Jon Corzine to look into (and answer my letters) how the state’s Office of Attorney Ethics allowed Vice-Chairman Robert Correale to use his influence as a high level member to block Legal Malpractice and Attorney Ethics charges from Correale and his law Firm, Maynard & Truland. After a deluge of my letters in 2003, the Office of Attorney Ethics had their nearby committee, District XI do a perjury-filled, malfeasance, lame investigation; where Robert Correale and his former law firm, Maynard & Truland were cleared of all charges. Correale and his law firm’s lawyers supplied no supporting evidence with their sworn certifications. However, I supplied Maynard & Truland’s own contract and invoices, along with Superior Court Documents, court-filed letters, etc. Over the years, Governor Jon Corzine has received, at least, seven U.S. mail letters (of which three were certified) and over twenty emails on this subject. All contained attached evidence. However, the Governor's office has NOT returned any communication. Additionally, Corzine's aid Susan does not return my phone calls, and her staff refuses to give me her last name. 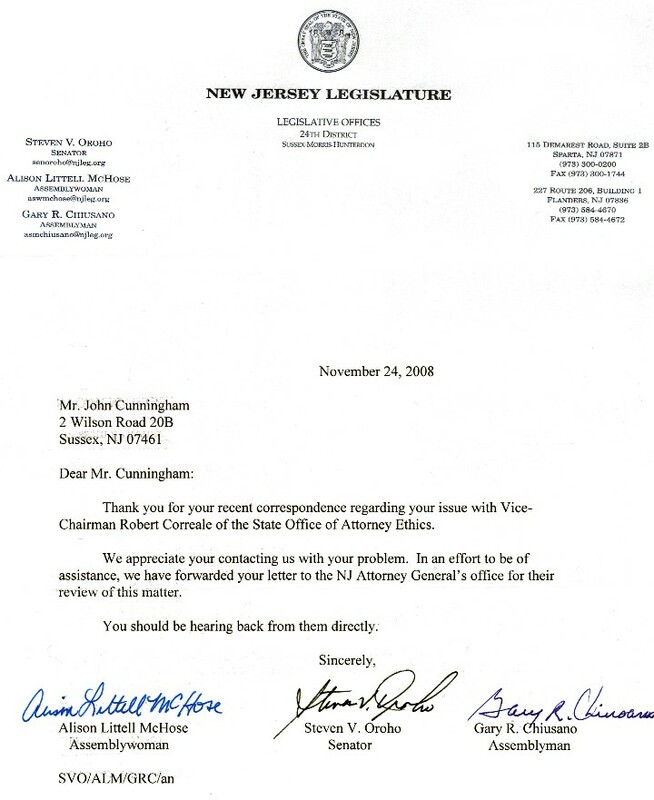 Governor Corzine’s lack of return communications only adds to this New Jersey State Government Cover-up. Due to being diagnosed and rated 100% disabled as a combat Marine, I suffer memory loss and request a copy of all communications with Corzine's office. As per your request, I have copied my New Jersey State Legislative representatives in the hope they will do their own follow-up with Governor Jon Corzine. Today, just like Jack Cunningham can not surrender to a bunch of corrupt lawyers and corrupt government officials, who have been protecting them for eight years, Jack could not surrender, when he served (24/7) in the Duc Duc Refugee village with eight other Marines. AFTER READING THE FACTS AND EVIDENCE, PLEASE PRESS HERE TO SIGN JACK'S PETITION REQUESTING DUE PROCESS FROM THE STATE OF NEW JERSEY. You Can Add Your Comments. Over 1,100 people have signed and hundreds have added their comments. The comments are very interesting. During that same period of time, 97 New Jersey State Employees using the domain of State.NJ.us have visited these pages. The Department of Justice USDOJ.gov about 50 times. THANKS FOR YOUR HELP IN GETTING THE WORD OUT TO THEM! Lawyers Should NOT Be Above The Laws In Any State. Please get in the free discussion at CITY-DATA.com: Why do our state politicians and state officials close their eyes to corruption.